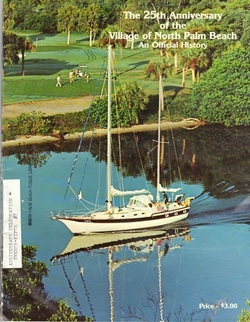 "In 1954 for $5.5 million John D. MacArthur bought 2,600 acres (11 km2) of land in northern Palm Beach County that had been owned originally by Harry Seymour Kelsey and later by Sir Harry Oakes. The land included most of today's North Palm Beach as well as Lake Park, Palm Beach Gardens and Palm Beach Shores. MacArthur then began developing what is now North Palm Beach, which sat on former mangrove swamps and farm land. The area was punctuated only by Monet Road and Johnson Dairy Road to the north and south and US 1 and Prosperity Farms Road to the east and west." It also notes North Palm Beach won an award from "the National Association of Home Builders as best planned community of 1956." You can more information on its history on the city's official website page, Village Historian. Below are official histories from the 25th and 50th anniversaries, used by permission of the Village of North Palm Beach. In 2016, the community will mark its 60th anniversary, and numerous events are planned. Check back for more details as they are available, or look on the city's official website. THE 25TH ANNIVERSARY OF THE VILLAGE OF NORTH PALM BEACH. Village historian William Young details the history of the city from 1956-1981. 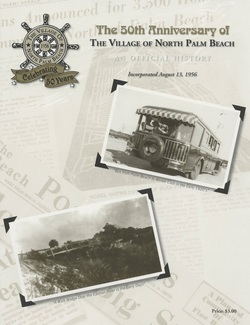 THE 50TH ANNIVERSARY OF THE VILLAGE OF NORTH PALM BEACH. Author Charlotte Chickering details the history of the city from 1956-2006.